As parents, it’s easy to assume our children know we love them. After all, we are the parents! It’s a very dangerous misconception. When a child feels unloved or unimportant, they do like we do, they search for a way to numb the pain that they’re feeling. 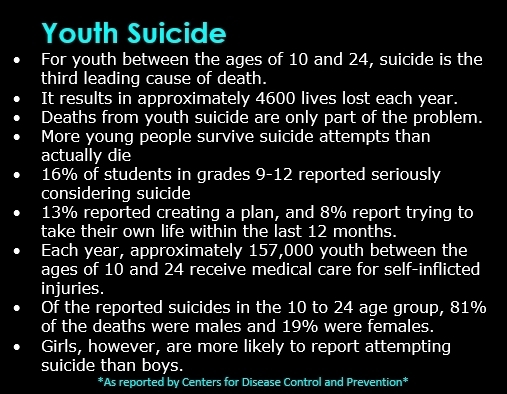 For over 4600 young people each year, suicide becomes that solution. One child is one too many. Every day, the news is filled with the abuse, abandonment and neglect of our children. We share it, voice our opinions, assign blame, and move on as we quietly disregard the thousands of stories that didn’t make it on the list of trending topics. Meanwhile, we commend and applaud a mother for going on strike and we praise the mother who made her child stand on the street holding a sign that declared him a bully and also made him a very easy target public target for other bullies, after being exploited on news networks and social media, and we call that parenting. Our children deserve more from us. Normal childlike behavior or adolescent rebellion is not an excuse for laziness and poor decision making. When it comes to a child’s self-esteem and happiness, the message received from a mother or father, is powerful and long lasting. Love isn’t automatically granted and it’s not a mutually understood factor between us and our children. They need to hear it, and the words are crucial. We should want to scream and shout it! We should encourage, inspire and protect, our children. You don’t have to be a parent for your love to matter to a child. Just open your eyes, look around you, reach out and get involved. No child should feel unloved or unwanted. In the ears of your child, your voice rings the loudest. My family responded with silence. Today, someone needs to hear this message, maybe someone else’s child. Today, someone is hoping and praying for a hand to help them up or a reason to keep holding on a little longer. 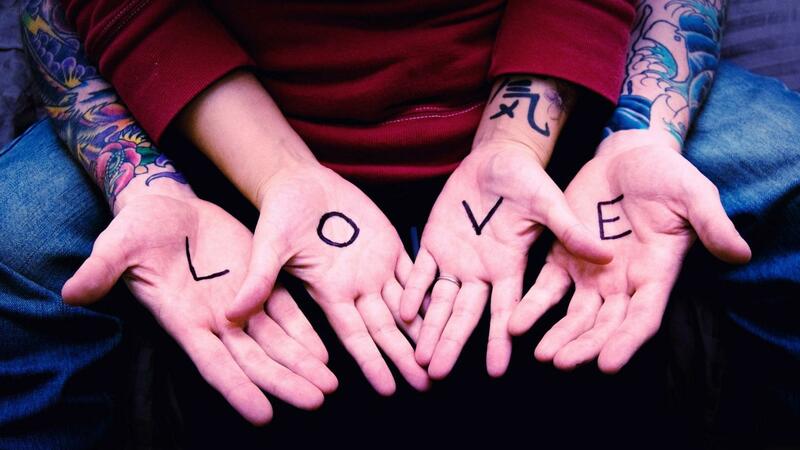 Today, someone needs us to simply give the same thing we desire: love! As adults, we have a habit of avoiding emotional connection, especially if we know the other person is struggling. That’s a habit we can’t afford to carry on with our children. Let’s break it. Two words, one life saving message. Tell your children that you love them and they matter! Be kind of adult and parent that you want your child to become. They’re watching you more closely than you think. Guide them and raise them with love and compassion. Our sons and daughters are the legacy we will leave behind us. Let’s make sure it’s a great one! And for all those grave numbers, I think about all the kids who are in pain. Who reach out and hurt each other from their pain. The confusion and despair they feel. I wish we could help them believe they matter. They do matter. Aw, that is kind of you. 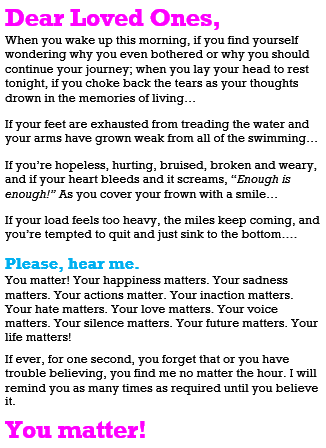 I’m going to tell all three of my kids they matter today. Maybe they will help spread the word, too. Our parents were raised by parents who didn’t hardly even talk to their kids. My stepmother was raised with “Be Seen and Not Heard” by her father who was born in 1875. (Yes 1875!!) He fathered children into his 70s, never changing what had always worked for him. It’s hardly surprising that her message to me was “Put up and Shut up.” A refinement, but essentially the same message. I talk to my kids. At least I do that right. You sound like a terrific mom. I can’t imagine getting tired of hearing that I matter. 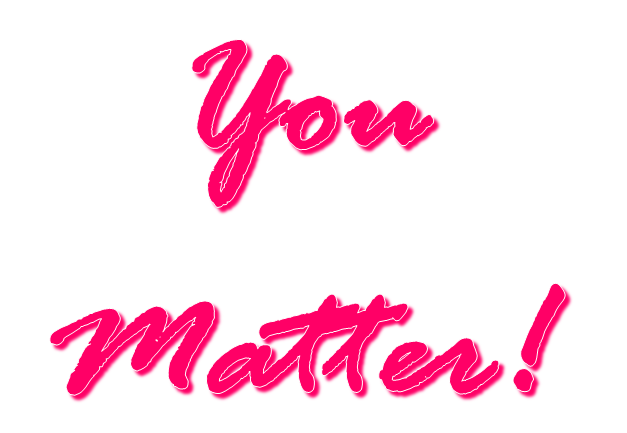 You matter, girl, at risk of being redundant. Yes!! Exactly. Just reading the words gives me chills! I almost told her to “hush,” a minute ago, but i didnt. I found the Excederine. Children grow up to teach their children what their parents taught them, all too often. That’s how we continue in our culture of violence. I want to teach my daughter that her voice matters, and to scream any message she finds important. Read it – do it. If you don’t, who will? Thanks for sharing such an important message! What if?! I’ll give it a go! And I will stand with you! Peace . . .